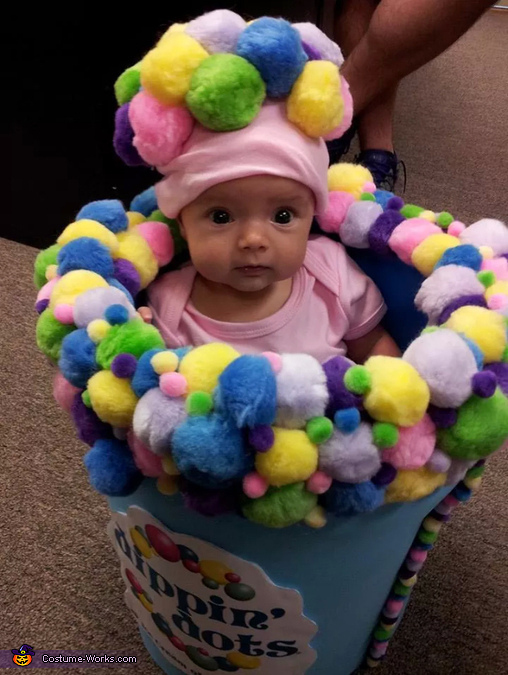 My 2 month old daughter is wearing the dip n dots costume. I came up with this costume because the whole time I was pregnant I could not stop thinking about dip n dots. So knowing halloween was her first holiday i chose to make her costume dip n dots. I went to walmart and bought a regular bucket and then went to hobby lobby and bought the balls and foam to cover the bucket and a hot glue gun and sticks. I then went and got her a hat, onesie, and socks and glued balls on them. and then we printed out the logo to glue on the front.